A lot of people have asked me what I think about Obama’s visit to Ghana, and specifically, his speech to Ghanaian parliamentarians. 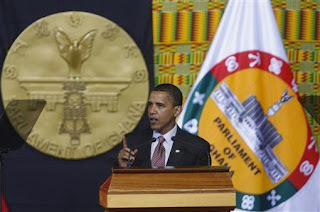 It’s undoubted that his presence in Ghana was a historic one – mainly because he is the first black US president, and Ghana is the first sub-Saharan African country to gain independence. It was also a great occasion because in many ways than one, Obama has succeeded in reminding a great number of people, about the possibilities that abound, if they are willing to work hard and take the necessary risks. Now that said, I did have some qualms about his visit, because it represents not only possibilities, but challenges too. I aired similar concerns in my article The Obama Effect & the African Illusion during Obama’s presidential campaign . Bottomline is, Obama’s successes can only be beneficial to Africans, if we regard them as proof that we can make a difference and be the change we want to see in our world. The moment we begin to conceive this single man as our “savior,” our chances of “redemption” will be thwarted. My choice of title for this article might sound pessimistic, negative or downright unappreciative. But before you draw conclusions, let me explain why I honestly believe that Obama only reiterated what we already know. This notion of “transformatinal change” is something that forms the cornerstone of development economics. Heterodox economists like Ha-Joon Chang and Robert Wade have stressed the importance of building capacities for change. According to Chang, “development is more than providing higher standards of living,” and is rather the “transformation of productive structire and the capabilities that support it.” Mr. Obama touched on some of these capabilities – namely good governance (democracy), opportunity (employment), health, and peaceful resolution of conflict (socio-political stability). Africans realized the need for them to handle their own state of affairs about 50 decades ago, hence the desire for independence from their colonial masters. Obviously, we have gone through a series of trials and errors which have resulted in our almost stagnant development. But it is exactly this process of trial and error that made us realize the importance of democracy. Obama rightly stated that different countries achieve democracy in different ways. And Ghana is no exception. Even though our semblance of democracy is far advanced than other African countries, there is still a lot to be done. The situation whereby newly formed governments terminate contracts haphazardly because they were initiated by the opposing party results in grievious loss of capital to the nation. I understand that there is the issue of allegiance and what-nots, but at what point are we willing to forgoe the notion of allegiance to this or that political party, and trade it in for allegiance to the nation? Even within our local social setups, the head of a family determines the direction the family will follow, so the need for committed leadership with the interest of the country at heart is undoubtedly imperative. With regards to health, Africa is plagued by many known diseases, and indeed has actually become the poster child for these diseases. From HIV/AIDS to Malaria, it would seem our very senses were being attacked by all the viruses known to man. When people think about health, the first thing they probably think about is a doctor. But pray tell me, how does this doctor get certified to treat his patients. The obvious answer would be education, but that aside, without research, many of the advancements in health and science would not be possible. Sure, many African governments allocate a substantial amount to health and education, but doing this without tying it in with research is backslacking on possibilities. In Ghana, a mere 1% of the budget is allocated to research. If we intend to have healthier and more productive societies, then we need to start thinking holistically. As Lauryn Hill would say, everything is everything. The circle of life extends to our institutions and market sectors – it is a give and take process. It is often said that is takes hours to prepare a good meal, but merely minutes to consume it. Ignoring socio-economic and political tensions in a nation is like placing a frail egg (development) on one’s head and playing ampe. Unless you find a way to secure it, it is bound to fall down and break. In my article The North-South Development Divide in Ghana: Why It Could Be Ghana’s Downfall , I elaborate on how the “selective development” currently practiced by Ghana – and many African countries – breeds discontent and leads to conflict. We have numerous examples where the neglect of the concerns of specific groups in society impedes the development of that society. Even Malaysia – one of South East Asia’s shining stars, and Ghana’s one-time counterpart – has had to concentrate on solving its people’s racial, ethnic and socio-political issues in order to pursue development. Excerpts of Obama’s speech taken from the Huffington Post.